The City of Des Moines has added an "eco-friendly," hybrid-electric diesel bus to it’s fleet of transit vehicles. Nancy Richardson, director of the Iowa Department of Transportation, says buses and other vehicles are responsible for 30% of all greenhouse gas emissions. "My message, as I talk with people around this state and nationally, is – in the transportation industry – we’ve got to quit just being part of the problem, we’ve got to begin to be part of the solution," Richardson said at an unveiling ceremony in downtown Des Moines. "This hybrid bus and starting to introduce these kinds of vehicles into our transit fleets is one good way that we in the transportation industry can be part of the solution." The 40-foot long vehicle is expected to cut greenhouse gas emissions by 30% compared to the traditional bus. 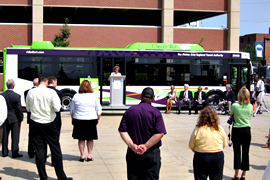 The hybrid transit bus in Des Moines is the first in Iowa. Richardson believes it’s one of only 1,000 in use in the U.S. and Canada. She’s hoping more Iowa cities will add hybrid buses to their fleets soon. "I think gradually, as we’re replacing fleets, we’re going to be looking more aggressively at trying to do hybrids," Richardson said. "They cost a little bit more money, but then there’s the environmental payoff. We’re hoping that we can gradually build up the fleet across the state." A hybrid bus costs around $560,000, while a traditional transit bus costs around $330,000. Federal funding paid for nearly 80% of the hybrid bus in Des Moines. Brad Miller, general manager of the Des Moines Regional Transit Authority (DART), says the hybrid bus will not require as many trips to the gas pump. "This (hybrid) bus will probably get about 30% better fuel economy, something in the neighborhood of six miles-per-gallon," Miller said. The hybrid bus will join Des Moines’ 150-bus fleet later this week. All rides on the new hybrid bus will be free to DART riders for the month of August. Richardson says bus riders in other Iowa cities could be hopping on hybrids in the years to come. She says the City of Ames has a hybrid bus on order. "What’s nice about that is they are getting a different brand (of bus), so we’re going to have an opportunity to do some comparison and analysis to see which is the most effective and that sort of thing," Richardson said. The Des Moines hybrid bus was built by Daimler Buses North America. It includes a bright green paint scheme, tip-in windows, regenerative braking that charges the on-board batteries and passenger seats made from recycled materials.